I'm sure for many of you, the real news here is that the old bread-loaf-shaped, rear-engined hippie wagon is still being produced at all. Well, it is, in Brazil, and will be ending its 56 year run in that country with a nostalgic final "Last Edition," of which 600 will be built. The actual life span of the basic VW Type II transporter is really 64 years, if you go back to the first generation that came out in 1950. Originally inspired by the Beetle-based flatbed runabouts used in the VW factory, a sketch by VW importer Ben Pon gave the bus its now iconic shape, and its role as a cheap utilitarian cargo vehicle helped pull Europe out of the rubble of WWII. Eventually it came to the US, became a counterculture staple, and generation after generation of 14 year olds have doodled and daydreamed about crossing the US in one. This final edition of Type II Kombi, as the Brazilians call it, looks pretty damn close to the ones built from 1973-1979 for Europe and the US, but the venerable flat-four has been replaced with a water-cooled inline-4 that burns sugar cane alcohol and makes about 80 HP, which for a Bus is pretty damn good. Sure, there's a very afterthought-looking grille /radiator stuck on the front, but other than that, it looks like it always did. This final edition even more so, since it offers the old-style white-over-a-color two tone paint (just over blue here), and even has striped upholstery reminiscent of 60s era VW interior color schemes. The best touches are the color-cordinated and Kombi-logo embroidered curtains, though. I'm pretty sad to see the old box go; it was a design icon, and managed to stay simple, cheap, and competitive throughout its working life, which is why it survived so long. I had previously hoped that a crash airbag-addition course would have saved the old Type 2, but it looks like the archaic design was just too old to be brought to modern safety standards after all. The 'Last Edition' Kombis will be selling for almost twice as much as normal ones, at about $36,000 US, which is an awful lot for the car if you're just looking at specs and grim reality. But nobody who's going to buy one of these is going to think that way at all, and I'm quite certain they'll sell all 600 of them. So long, Microbus. 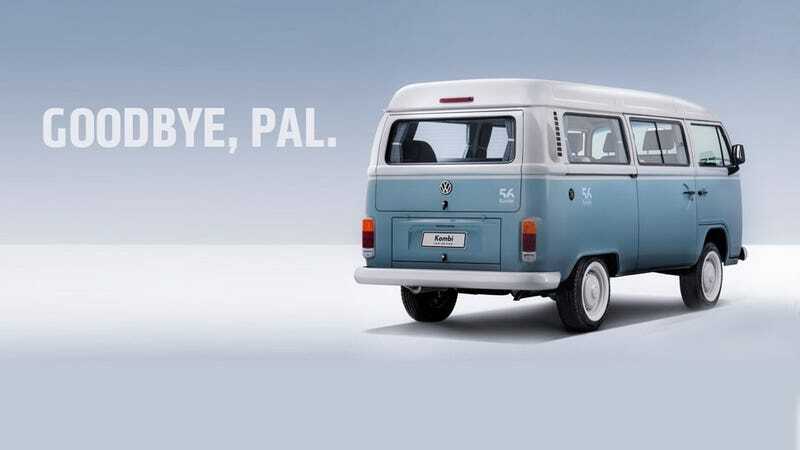 Maybe in the great afterlife garage you'll be able to convince VW to bring out a real replacement for you like they've been teasing us with for all these years.